Thursdays we are open until 8:30 pm for Open Jam Night with local musicians! Taste our Daily Flight showcasing a mix of white and red wines for $10 or our Reserve Flight highlighting our small-lot bottlings for $15 (complimentary flight with a Priority Wine Pass). 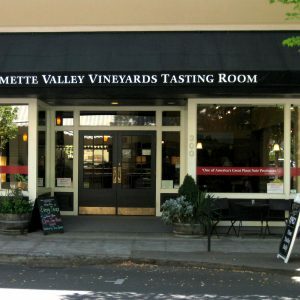 The Willamette Valley Vineyards Tasting Room in McMinnville provides an opportunity to experience our award-winning Pinot Noirs right in the heart of downtown McMinnville. Our knowledgeable and friendly staff will guide you through flights of our certified sustainable wines. We also offer a soothing atmosphere to relax with a glass of your favorite wine while taking in the sights of historic 3rd Street. Feel free to stop in anytime and be sure to check out our upcoming events. We also host a variety of wine tasting events, dinners and take part in many local functions.